That arrived in my shop in crates. And boy, don’t they look ATROCIOUS! Proform Parts displayed these mournfully gaudy powerplants at the SEMA show this year. As Autoevolution reports, the two turned a lot of heads, even though they’ve visited SEMA before. The engines in question were originally respectable, stock V8 crate motors from Chevrolet and Ford Racing. Proform Parts typically sticks to dealing in high-horsepower performance parts, but has a bit of an affinity for attempting to continually up the ante for dressed-up motors. The two V8 motors are covered head-to-toe in genuine Swarovski crystals, on the air filter housings, the valve covers, and anywhere else they could get the precious stones to stick. The Ford Racing V8 adds to that 24-karat gold covering the exhaust manifolds, as well as about a dozen smaller parts. As Autoevolution points out, the pair of motors recall (to some extent) the crystals adorning the headlights of the 2015 Mercedes-Benz S-class coupe, and to a greater extent, the gold foil used in the McLaren F1’s engine bay. But the gold foil in the latter example serves the very utilitarian purpose of deflecting the V12’s massive heat output away from the carbon structure. 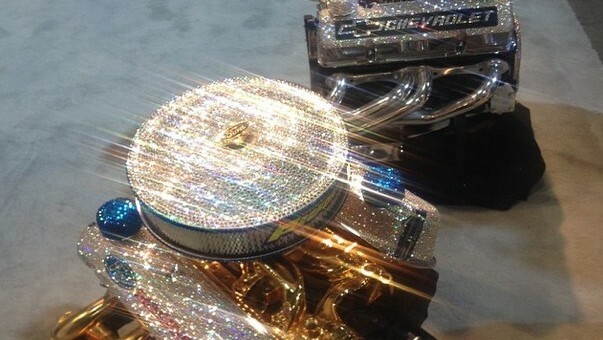 Proform Parts V8s, what’s your excuse for being so blinding? I can see the appeal in having jewels dotted along an edge or packed together tightly on a ring. Engines, generally, aren’t usually something that can be easily encrusted with gems and then offered for aesthetic criticism and analysis. You can do it, but sticking gems on things haphazardly without preplanning or even an intent will make your efforts look like the engine has glue applied to the heads before it was dipped into a bin of jewels.